We're a inmobiliraria agency, our work, generating added value to our customers because they not only perform the real work but we also engage directly with the needs of our customers; offering advice to sell at a reasonable price and in the shortest possible, or to help you acquire the best choice according to the possibilities and requirements of each individual time. 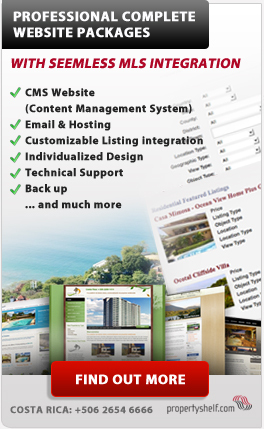 We have extensive experience in the field of brokerage, our database includes properties within and outside the country, through the Real Estate Exchange CCCBR, MLS Costa Rica http://mls-cr.com/es. We work any type of property: residential, commercial, buildings, villas, farms, beach properties etc. We are in the best position to provide and to share with you all the necessary information related to this activity. It will always be our goal entirely fill the expectations of our customers and become your business partner seeking to promote a timely, efficient and ethical business for both parties.